Electric Helicopters Will Give You A Charge! They'll Give You A Charge! Electric Helicopters continue to experience the strongest growth segment in the RC helicopter hobby right now. This of course is due to better battery, motor, and micro electronic technology that was not available even a few years ago. 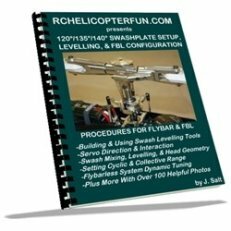 For all the reasons outlined in the Best RC Helicopter Power section, growing popularity will continue. Don't think electric RC helicopters have caught up to & surpassed nitro in terms of performance and better power to weight ratios? Well, watch Bert put a SAB Goblin 700 through the paces (same size as a larger 90 sized nitro powered bird). Very Impressive! 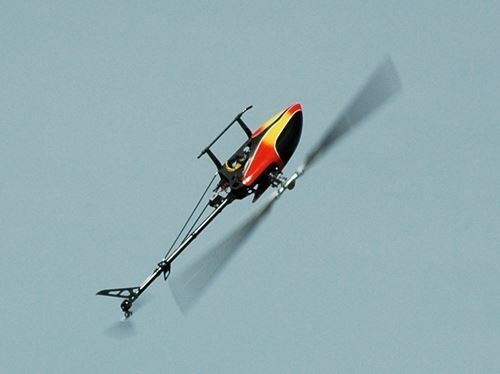 Electric RC helicopters are now also the fastest RC helicopters with some reaching upwards of 300 kph (190 mph). These "speed specific" designs such as shown above are built for one thing and one thing only, setting speed records. The tall shape of the canopy covers as much of the exposed mechanics and rotor head as possible. Likewise these speed specific electric helicopters are very thin in width making them very "slippery" to the air. Not being constrained by bulky engine, fuel, and exhaust systems, along with many electric motor placement options, allows electric RC helicopters to take on some stunningly streamlined & beautiful designs as shown above with the exotic looking Takumi 700CF. 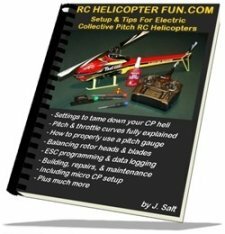 It wasn't all that long ago I swore I would never fly an electric collective pitch RC helicopter. However, once I flew a proper lithium polymer (LiPo) powered one, I was instantly hooked on electric flight. My personal favorite thing about electric helicopters is the noise they produce. Watch/listen to that Goblin 700 video and you'll know exactly what I mean. The quiet electric motor really allows you to hear the rotor blades interacting with the air and "barking". That sound is hard to beat! It's why most of us want to get into larger RC helicopters as you don't get that wonderful noise with small ones. Tail rotor noise is also more noticeable. Not dealing with messy nitro goo, engine starting & tuning hassles, running hassles, excessive vibrations, starters and glow drivers, or shipping costs associated with nitro fuel are all other electric helicopter benefits. True, LiPo battery shipping is starting to become a hassle as well, but it's still much easier and less costly than shipping nitro fuel. Electric RC helicopters are simply more convenient and vastly more reliable in most cases. The other neat thing with electric helicopters is the motor and gearing spinning sound somewhat similar to a turbine powered RC heli making them increasingly popular in scale RC helicopter applications providing a more realistic sound. Electric Scale AirWolf RC Helicopter - No Mess, No Fuss, Great Sound! The introduction of electric toy RC helicopters and electric micro coaxial RC helicopters are successfully and inexpensively introducing beginners and newbies to this wonderful hobby. Moreover, all the new quad and multi rotor RC heli designs are only possible because of electric power. To say the future looks bright for all forms and types of electric RC aircraft is an understatement. Shown above is my smallest electric collective pitch RC helicopter, the Blade Nano CPS sitting on the rotor blade of my largest electric RC helicopter, the Align Trex 800E. The Nano has a main rotor diameter of about 7 inches (180mm), while the T-Rex 800E's rotor diameter is about 6 feet (1800mm). Yep, an order of magnitude size separation. There are a few slightly larger electric helicopters with rotor diameters approaching 7 feet (2000mm), and a few slightly smaller at just under 6 inches (150mm), but that should give you a fairly good idea of the electric RC helicopter "size spectrum". The other HUGE benefit with "smaller" size electric RC helicopters is they can conveniently & safely be flown at home, both inside and out. Due to increasingly overreaching RC flying regulations world wide (mostly caused by irresponsible rc drone fliers I might add), small & safe electric helicopters such as these might be the only type of RC helicopter some of us are legally allowed to fly anymore. Shown in the video below is the micro sized electric Trex 150X collective pitch RC helicopter being flown indoors, performing aerobatics. This is something us RC helicopter enthusiasts could have only dreamed of a decade ago; but now thanks to clean electric power and micro electronics, the dream has become reality! The overall design of hobby grade single rotor collective pitch electric helicopters is no different than that of nitro or gas. The controls, construction, and setup are very much the same. 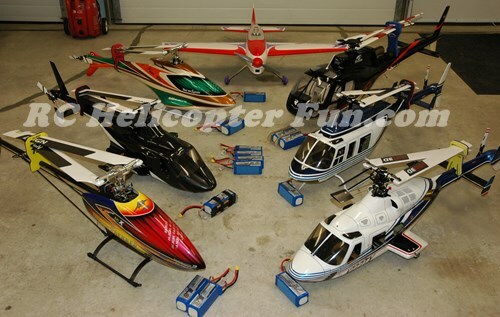 In fact, several manufactures offer the same model helicopter kit in both electric versions and nitro versions, or supply electric conversion kits. The main differences are having an electric motor instead of a nitro or gas engine, a battery pack/s in place of a gas tank, and an electronic speed controller (ESC) in place of a throttle servo. The photo below shows a typical layout/position of these "electric heli specific" components. Efficient High Output Brushless DC Motors. High Power Brushless Electronic Speed Controllers (ESC's). The photo above shows how these three main components are connected electrically. 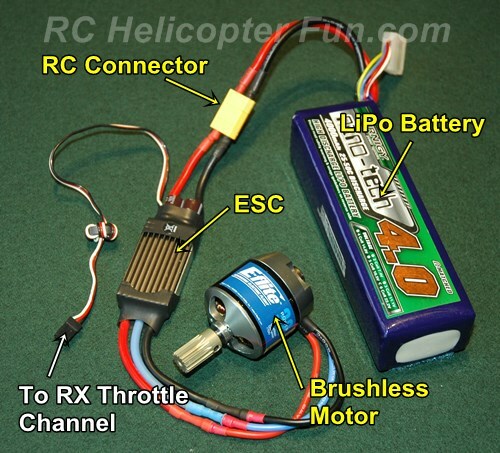 The LiPo battery plugs into the ESC using an RC connector. The ESC gets throttle position signals from the RX's throttle channel. The microprocessor controlled ESC generates alternating 3 phase (thus three wires) sinusoidal waveforms to energize the windings in the brushless motor at the exact correct time, at the correctly polarity, and in the exact correct sequence to turn it and control its speed. Brushless DC motor is actually an incorrect description for these motors. They are in fact a 3 phase AC motor, but the hobby industry has more or less adopted, and uses the fundamentally incorrect description. Likely because it's easier and more intuitive for people to understand. Without these three technologies, electric RC helicopters would remain small with poor performance. As LiPo batteries continue to come down in cost, the NiMH and NiCad type battery packs have pretty much been completely phased out other than on the cheapest and smallest electric powered RC helicopters. LiPo's packs are used in pretty much every electric powered RC helicopter now (or LiFe - another form of lithium rechargeable chemistry). What About Costs? I Heard Flying Electric Is Much More Costly Than Nitro? That perhaps was true a number of years ago when LiPo batteries were grossly expensive but this is certainly no longer the case. This is a good question however so let's look a little deeper. Electric flight can get expensive if you want to be flying back to back flights between battery charges because you will need several packs and on bigger birds, it's not hard to have as much or more invested in LiPo packs as you have in the heli. Computerized LiPo chargers and power supplies for the chargers are also required so that adds to the costs; however you never have to purchase fuel again and nitro fuel is pricey as well. Pay up front for electric or pay as you go for fuel. In the long run, you will generally be money ahead in operating costs with electric over nitro fuel - even with the bigger birds. 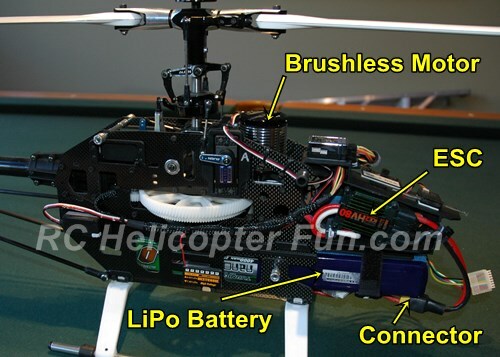 Case and point... A 700 size electric heli (seen below) requires two 5000mAh 6S LiPo packs wired in series per flight. I have one dozen (12) LiPo packs for that bird so I can get 6 back to back flights between charges. Each pack costs about $70.00 ($840.00 total). Sounds expensive when you look at it that way, but when you break it down to cost per flight the numbers get really attractive. If we treat our LiPo's with the care they deserve, we should be be able to get at least 1800 flights out of those 6 pairs of packs over their life span. This is assuming 300 charge/discharge cycles on each pack which is a possible life span, albeit with kid glove care. So that works out to about 50 cents a flight. Let's be a little more realistic here and say we don't give these LiPo's the best treatment and half their life span down to 150 flights or so. We are now looking at $1.00 a flight. A 700 size Nitro on the other hand burning up a 4L jug of $30.00 dollar nitro fuel in as little as 8 flights works out to about $3.75 a flight. We haven't factored in the costs of charging equipment and electricity for electric, but even then, the cost per actual flying minute between both are still lower with electric in almost all cases. Please don't let those high battery costs scare you away from electric. You certainly don't need to purchase all the packs at once. I slowly built up that small heard of electron storage over the course of a year or so. Also, those numbers were using a large 700 size helicopter as the example. Smaller electric birds don't use expensive packs like that and you can purchase a half dozen or so LiPo's for a very reasonable price. Base Your Future Electric RC Aircraft Purchases On What LiPo Packs You Already Own Will Save You Even More Money! This is a trick so many of us electric fliers do that can save a good deal of money. Once you are into electric flight, no question, your LiPo battery bank will start to grow in number. 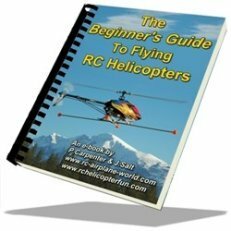 Purchasing other electric helicopters, quadrotors, or airplanes after researching what voltage/capacity LiPo packs they use will allow you to utilize the packs you already have so you don't have to get new ones. Likewise, as your LiPo packs wear out over time, the new replacement ones you get of the same voltage & capacity will continue to work in your "electric RC fleet" that share these LiPo packs. For example, one of the most useful voltage and size/capacity LiPo packs I have are 6S 5000 mAh ones. I have a good number, of them and they work in a good deal of electric RC aircraft that I chose to specifically utilize my growing number of 6S 5000 mAh packs. Shown in the photo above are most of the electric RC aircraft I currently fly that use 6S 5000 mAh packs. Some of the larger helicopters here need two 6S 5000 mAh packs (as I mentioned before about the Trex 700); but again, these are just such useful and universal size LiPo's for so many larger RC helicopters & planes. My very first electric powered plane (the Eflite Carbon-Z Splendor in the back), also uses one of these 6S 5000 mAh packs. Other than it being a great airplane for the price, the main deciding factor for me was I could use my current LiPo's in it making it a very attractive & affordable way to get back into sporty fixed wing flight. It definitely has a much higher power to weight ratio than any of my previous nitro planes had! Blade make some very nice entry level electric RC helicopters for beginners at very reasonable costs. The reason I am so impressed with most of E-flite's/Blade's stuff is all the models use DSM2/X spread spectrum modulation. Meaning that they can all be controlled with any good Spektrum/JR DSM2/X radio (this system is called Bind-N-Fly - BNF). This saves time and money - two things most of us are short on these days. You can also find Blade parts at almost every hobby shop in the world. As you know, parts availability is one of the most important criteria I place on choosing a good heli. Once you progress in this hobby or want to start out with a higher quality bird off the bat - Align's T-Rex electric helicopters offer up the best quality for the price in my opinion (best bang for the buck as the saying goes). Here is my full write-up on Align Helicopters if you are interested in learning more about them. From the small Trex 150 to the large 800E, Align's parts and components in all their kits are top notch and offer great value. I currently fly three Trex 600's, a 700E, an 800E, a 450, a 250, and a 150. All have been top performing machines and continue to provide lots of "electric" fun. Once again just like Blade, Align's parts availability is very good world wide, but Align's quality is much better. If you already can fly collective pitch and are looking for one of the best high performance and highest quality electric helicopter brands out there, it's hard to beat SAB Helicopter and their line up of Goblins from the 380 up to the 770. SAB Goblin's pretty much rule the skies these days when it comes to high performance 3D competitions and are one of the most successful RC helicopter brands going right now. Electric helicopters are a compromise between size, power, performance, and flight times. In recent years however, those compromises have faded substantially. I only have one nitro heli left in the fleet and I haven't flown it now in the past five years compared to the thousands of flights on my electrics. Yep, I'm one of those old nitro guys who has been converted, 100%!